Back by popular demand! Now expanded to ten hours! 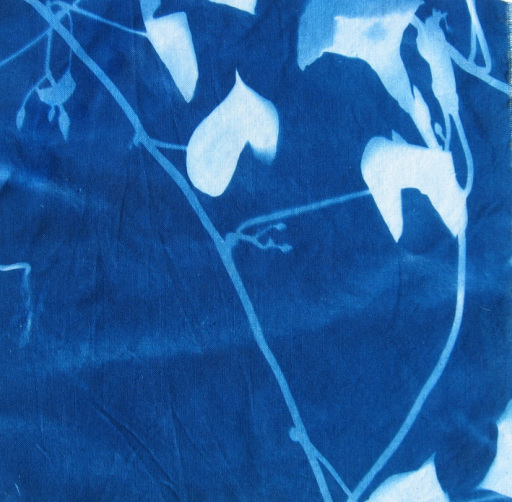 Make one-of-a-kind photographs with the historic process of cyanotype. Students will learn about the discovery of the process and the history of photography and see some examples of early cyanotypes, as well as more contemporary works. In the lab portion, students will make their own handcrafted cyanotype prints with simple materials, sunlight and water. These prints – photograms – are made without a camera, lens, film, darkroom or computer. Each print is unique. As this is a chemistry based process, students will also learn about the safety and proper handling of the materials. In case of inclement weather, we will use an indoor UV lightbox. Included is a $15 materials fee. 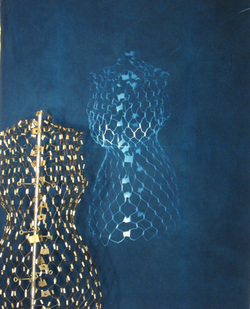 A list of other suggested materials will be supplied upon registration. Pinhole Photography - Now With More Darkroom Time! Learn the history of photography; see some early camera designs and the interesting pictures that come from them. We´ll discover how we can adapt and adopt the basic functions of these early cameras for our own hand-built pinhole cameras. By the end of the first day, we should have our cameras ready to start shooting pictures using photographic paper negatives. The rest of the workshop time we´ll continue learning how to load and shoot pictures with our cameras. We´ll tweak and troubleshoot as needed. 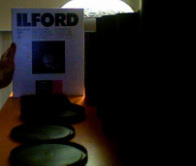 Then we´ll go in the darkroom to develop our paper negatives and make prints. This is a hands-on course using sharp tools and photochemistry. Included is a $15 materials fee. All levels welcome. I led a workshop on pinhole photography at Creative Arts Workshop. This workshop was a full-day, including building your own pinhole camera and then using it to shoot black and white prints. Contact Creative Arts Workshop for more info. Take the mystery out of photography when you learn how to make your own working pinhole camera. The pinhole camera is a simple device that can take unique pictures with infinite depth of field. You can make a pinhole camera out of just about any hollow object. In this course, students will learn about the history of photography, see some of the first camera designs and the earliest known photographs. Then we'll discover how we can adapt and adopt the basic ideas behind these early cameras for our own hand-built pinhole cameras. In part two of the workshop, students will learn to start shooting pictures using photographic paper negatives. Then we'll go in the darkroom where students will learn how to develop paper negatives and how to make prints. This is a hands-on course using sharp tools and photochemistry. This workshop introduces the alternative analog photographic process, cyanotype, discovered in 1842, later used to make blueprints. Students will learn about the discovery of the process, its history and see some examples of early cyanotypes and more contemporary works. In the lab portion of the workshop, students will make their own handcrafted cyanotype photogram prints with simple materials, sunlight and water. These prints, called photograms, are made without a camera, lens, film, darkroom or computer. Each print is unique. As this is a chemistry based process, the safety and proper handling of the materials will also be taught. Students will make up to four cyanotype prints to take home and will also receive handouts and instructions for setting up your own analog photography project. A simple but delightful optic phenomenon can be created with a few materials and some basic physics and mathematical formulae. This workshop emphasizes collaborative design and teamwork in building a walk-in camera, also known as a camera obscura. Learn about optics, light, and how this device became the basis for modern photography. Begin with an introduction covering the science and art of optics, examples from history, modern, and contemporary artists. We then set out to design a site-specific camera obscura. Materials are customized and the building process begins. Once the last piece is in place, we then test the design and make any necessary adjustments. Students can document the images projected into the camera obscura with digital cameras. A drawing component can be added for an opportunity to draw what is projected into the camera obscura. Appropriate for elementary and high school students through an interdisciplinary program of science, math, humanities, and art. Special rates apply for educators; please inquire.